Not to ruin your day or anything, but we are extremely close to the end of our planet’s finite supply of David Bowie songs. The iconic musician was kind enough to give us one last great album before he returned to the cosmos in January. And then we discovered that lost album, The Gouster, over the summer. That was pretty neat. 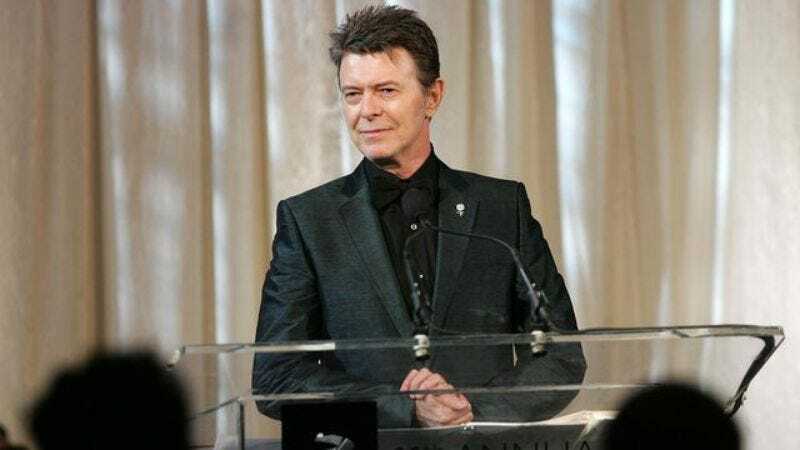 Now—unless there’s some other hidden collection of songs locked in a hyperbaric chamber under the sea somewhere—the upcoming release of the Lazarus cast album will be the final helping of Bowie’s studio work. Several unreleased originals will be appended to the collection of songs for Bowie and Enda Walsh’s musical adaptation of of Walter Tevis’ 1963 novel, The Man Who Fell To Earth (which was also adapted by Nicolas Roeg and Paul Mayersberg for the 1976 film starring Bowie). And, while the album isn’t officially released until October 21, the BBC previewed two of the songs earlier today. “When I Met You” can be heard 51 minutes into this morning’s BBC 6 Music program, and “No Plan” was dropped about 46 minutes into Jeremy Vine’s BBC Radio 2 show. These two tracks, as well as the third new one from the album, were recorded in-studio by Bowie and the Blackstar musicians, with production by Bowie and Tony Visconti. The rest of the soundtrack is mostly made up of reimaginings of songs from Bowie’s five-decade career, performed by cast members including Michael C. Hall and Cristin Milioti. Here’s Milioti performing “Changes,” in case you’re feeling skittish about the quality of this album.